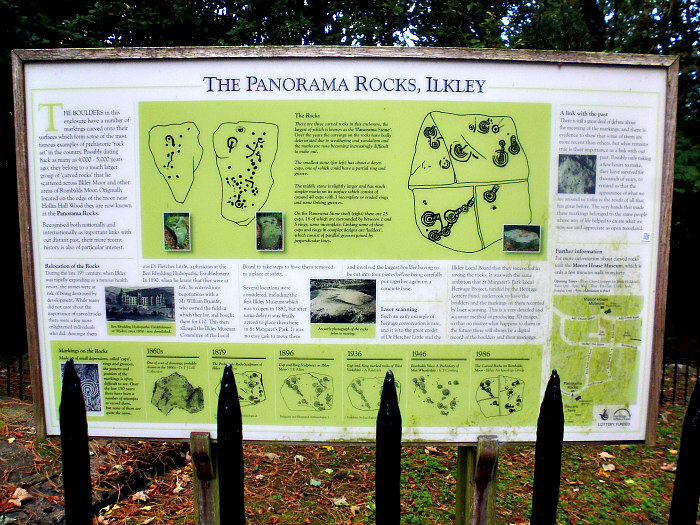 Panorama Rocks Information Board at St Margaret’s Gardens, Ilkley. OS Grid Reference: SE 11496 47298. In the woodland of St Margaret’s Gardens also known as the Park opposite St Margaret’s Church on Queens Road in Ilkley, west Yorkshire, lie (behind iron railings) three large flat stones that were originally situated upon Ilkley Moor, ½ a mile to the southwest. These three stones or rocks were famous for their cup-and-ring carvings, but unfortunately the carvings are now very faint and not easy to make out; and two of the rocks were broken while being transported to their current location. There is a good information board here which gives details and illustrations of the 5,000 year old rock carvings. From the B6382 (The Grove) walk south up the steep Back Parish Ghyll Road and onto Albany Walk, then cross over the road and continue south up the steep lane to Queens Road and St Margaret’s Church. Walk onto Princess Road and there on the right-hand side are St Margaret’s Gardens and the railed off enclosure beneath the trees; the section with the stones in was locked when I last visited. Panorama Stone in St Margaret’s Gardens at Ilkley, west Yorkshire. Panorama Stone and a close-up of the carvings. 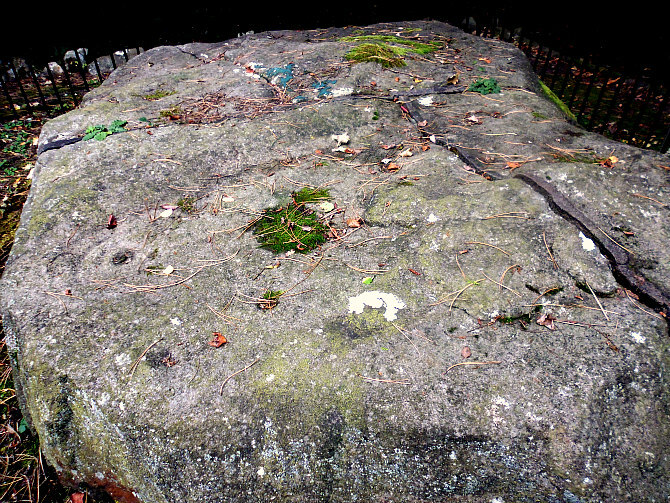 The three stones with their 5,000-year-old carvings are rather hidden behind the iron railings in the woodland at the edge of St Margaret’s Gardens, and the carvings (petroglyphs) are now quite faint and not easy to see, and they often have leaves covering them and moss growing in the cup-markings. The largest rock of the three is the actual Panorama Stone and, with the two smaller stones, was originally located behind the reservoir in Panorama Woods at about SE101470. They were brought to their current location in the late 19th century after ‘being’ found to be in the way of the town’s building extensions onto the edge of Ilkley Moor, also known as Rombald’s Moor; two of the rocks, one being the actual Panorama Stone itself, sadly, cracked as they were being lifted and this was made worse during transit. 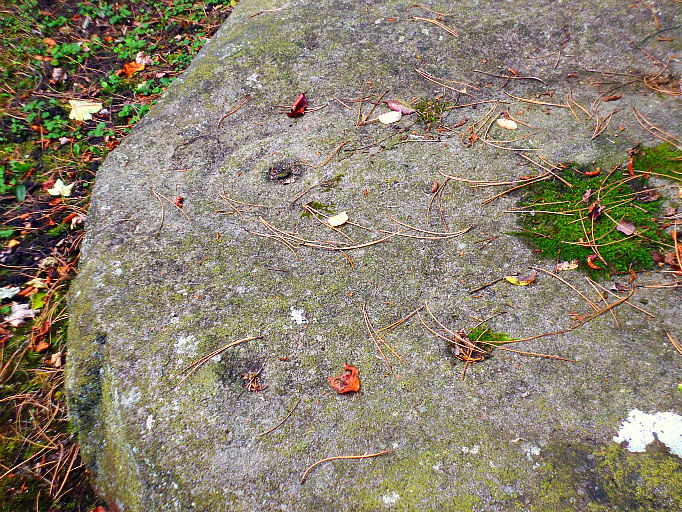 All three stones have cups with concentric ring carvings, or just cups on their own, but there are other curious designs too including lines or gulleys and ladder-like carvings linking or not linking cups, though most of these carvings are now only visible when the light is right! Barringer, J. C., The Yorkshire Dales, Dalesman Publishing Company Ltd., 1982. Longworth, Ian, Regional Archaeologies – Yorkshire, Heineman Educational Books Ltd., London, 1969. Categories: Cup-And-Ring Markings | Tags: Panorama Stones in St Margaret's Gardens at Ilkley west Yorkshire | Permalink.